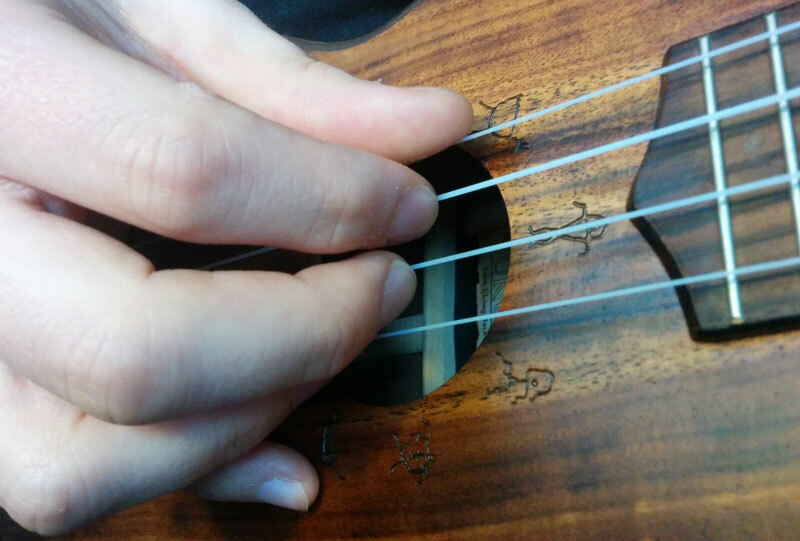 In a recent article we discussed advancing our scale routines using specific fingers for each string on the uke, that way we could start peppering our chord progressions with notes. 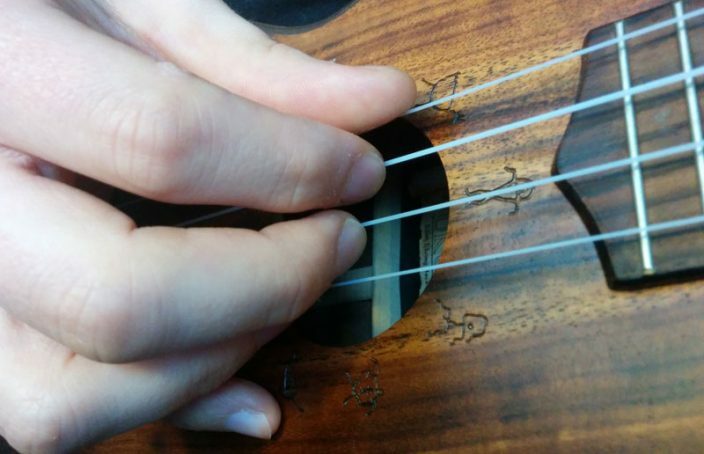 The basic and beginning way to play the ukulele is to use the index finger or thumb (or both) to simply strum up and down, however once we start adding in notes we get into the fun world of fingerpicking. Below we will discuss some basics on fingerpicking, however there is nothing wrong with just doing whatever works for you. One of the keys to fingerpicking is actually having memorized your chords and being able to switch quickly back and forth in a progression. If you are still having trouble with that you may want to hold off on fingerpicking for awhile, otherwise it is difficult to be focusing on both hands at the same time. Grab your Uke and play the chords C-G-F, but instead of strumming, pick your way through them. Just play what sounds good, find a pattern and stick with it! Sometimes it will sound pleasant to end on the bass note of the chord, other times the opposite may be so, it really depends on the song you are playing. Play this slowly at first and then start to speed up as you get the hang of it. After you have it done switch to the G chord and play the same pattern, then switch to the F chord and continue. Finally, you can end on this same pattern on the C chord. It is a very pretty sounding and easy pattern that doesn’t take long to get the hang of. Of course as you play it you can also mix strums in with your fingerpicking. I prefer to fingerpick the C, F, G, and then on the final C chord I do a double strum by strumming the chords with my thumb and index finger at the same time. The thumb moving downward and the index upward from the bottom. The best sounding way to play this roll is to strike your thumb on the G string and then come up from the bottom with your ring, middle, and finally index finger. With this method your index will end on the bass note of the chord. You must start very slow with this style of fingerpicking and work your speed up a little every single day, when done fast it will sound very pretty. Eventually when your fingers are trained to hit each specific string you can switch the order you are playing anyway you like. Sometimes I will completely leave out the high A string while fingerpicking. I use my thumb for the top G string and then alternate between the middle finger on the E string and the index finger on the bass C string. This is a nice roll that has a tiny bit of a deeper sound because we have removed the last higher pitched string. While practising this pattern I like to play the 3rd fret of the E string, followed by the 2nd fret, 1st fret, and then 0 on the same E string. It has nice descending sound to it that can be repeated over again during an intro to a song. Some players like to alternate between the G and E string and then alternate between the C and A string. Honestly that only sounds good on occasion. Because of the re-entrant tuning of the Uke we are limited on what might sound good jumping from high to low pitch and back. Perhaps using a concert ukulele with a special low G bass string will open up a larger world of fingerpicking, that way you have two low bass strings and two higher pitched strings on the bottom. There are many different styles of fingerpicking out there to choose from, it is really something that you can make your own depending on the song you are playing. Pick a few basic styles and practice them everyday, after a few weeks your fingers will feel more comfortable with the movement and they will begin to venture off on their own as you play. You will find that it sounds great to mix strums and fingerpicking at the same time. You may also find that changing the pattern up is necessary as you play the chords. I have been playing so long now that I don’t consciously think of a certain pattern when I pick the Uke up to play. My fingers just go to where it sounds good for the song, muscle memory and ear training over time really are the best way to become great at fingerpicking on the ukulele. One note needs to be made about anchoring, this is the process of holding fingers down on the ukulele soundboard while finger picking. Often the pinky and maybe even the ring finger are anchored to the soundboard while the middle, index, and thumb do the picking to help steady the hands. Fingerpicking position on the ukulele, the little finger anchored to the soundboard.